In a world of political turmoil, we often forget about the very emotions that make us human. Compassion and sympathy are two of the leading feelings that make us interact with one another and act for a greater purpose. We are stronger and better when bound together acting in coherence to achieve something beyond our individual capabilities. Yet, this is often not possible without a common goal, leadership and a type of organizational structure to keep us together. That’s why nonprofit organizations exist. While the goals of a nonprofit can vary widely, the most common scenario is that they help us act towards the good for all people, animals or the earth itself. To go viral, a post often is aimed towards certain instinctive human emotions. This alone should make nonprofits have perfect social media scores, right? Nonprofits act upon our compassion and sympathy and those very two things are what make certain campaigns go viral. Thus, it should be a done deal. Yet, it’s not. Social media is a landscape that requires far more effort than the simple act of viral-potential shareability in posts. That’s why, whether a nonprofit or a corporate magnate, all organizations and individuals that want to achieve social media success should have proper branding and marketing strategies. Huge budgets are needed to run a proper social media marketing campaign. Especially, when the targeted customer base is not strictly defined. With that in mind, we can’t help but wonder, how do nonprofits perform on social media? Using our leaderboards feature and the analytics we have at our disposal, that’s exactly what we set to find out. Without further adieu, here are the top nonprofit organizations on social media. Our Leaderboards feature allows you to rank profiles on social media in a variety of categories based on different social networking metrics provided by the platforms. We’ve selected the top performing nonprofits on social media based on their audience size. We neither condone nor support the actions of those nonprofit organizations. This is a mere analysis of the data. Looking at the leaderboards for the top performing nonprofits on Facebook, it’s not surprising to see some familiar faces. Starting with Breast Cancer Awareness via TheBreastCancerSite, through the Animal Rescue NGO and ending with Unicef, popular nonprofits brands seem to rule the social media game. Of course, there are some organizations that are not as familiar in the west, yet have some great audience numbers.They include the Haltaalam.Culture and 57357Egypt. The organization aimed for the abolishment of slavery in Iraq, FreedomUnitedHQ, is also on the list. But goals and humanitarian efforts aside, we did find the numbers quite surprising. First and foremost, as expected, none of the nonprofits on the top list had any major promoted post efforts, boasting 0% promoted post efforts. However, even with the 12 million strong audience of Ipandacom, the engagement doesn’t seem to go above one million. In fact, the only two organizations with engagement close to surpassing the milestone were Exploredogs with 1,6 million of total engagement and the aforementioned Haltaalam.Culture with 1,99 million. The lowest number is the 2,119 from FreedomUnitedHQ, which is that much more surprising. The other statistic related to the performance of the top nonprofit organizations on Facebook, Engagement Rate, is also hard to ignore. The highest engagement rate was noted from NumbersUSA with 0.24% followed by Haltaalam.Culture with 0.17% and the lowest from FreedomUnitedHQ, being the lowest it can be at 0.00%. Across the board the ER is lower than 0.2%, which is extremely surprising and notes that Non Governmental Organizations should consider changing their social media marketing strategies. The sentiments are also average, with the top coming from iPandaCom with 64, followed by ExploreDogs with 62 and Haltaalam.Culture with 61. Despite their near non-existent engagement, FreedomUnited has a 51 score in statement, scoring higher than NumbersUSA, which has the lowest score of the bunch with 49. What that shows us is that despite the overall positive effects of nonprofits, audiences are not that keen on such messages, at least not from the biggest NGOs on the map. Yet, the score of NumbersUSA is pretty expected due to the controversial matter of their message regarding responsible immigration policies in the US. Instagram is a social network where a visual message is the strongest way to achieve engagement. This becomes even more obvious, when taking a look at the top Nonprofits on Instagram. Across the top 10 of the biggest NGO brands on Instagram you can note PETA, GreenPeace, Unesco and the ObamaFoundation. The WWF took two spots on the leaderboard with its two Instagram profiles “world_wildlife” and “wwf,” while the WorldPressPhoto organization also manages to expectedly get a spot on this list. The Malala Fund organization for young girls education support, led by Malala Yousafzai is another NGO that has a strong Instagram following. The top three places are taken by Escolhiesperar (“I Choose to Wait”), a Christian sexual preservation organization, Unicef and the WWF with their “world_wildlife” account. It’s not that surprising to note that an animal-based NGO takes a Top 3 spot on an Instagram list. However, finding a Christian sexual preservation organization taking the second place was rather surprising, considering that social media usually caters to pop-culture based beliefs. Yet, this is primarily in terms of audience numbers. When it comes to top total engagement Unicef at 1,58 million is closely followed by Escolhiesperar, at 1,56 million with all other profiles in the top 10 list dropping to below 500,000 total engagement with the exception of the ObamaFoundation at 521K and PETA. In fact, PETA is the only brand on the list, which total engagement surpassed its audience numbers, with 1,30 million. The engagement rates of nonprofits on Instagram are also quite good, especially when compared to the top NGOs on Facebook. Particularly, MalalaFund has an ER of 5.41%, while the ObamaFoundation has a total ER of 5.18% at the second place with the WWF taking the third spot for ER with a total of 2.08%. The lowest scores were from UNFICEF at 0.99% and Worldpressphoto at 0.50%. It’s not that surprising that the sentiment score of all nonprofits on Instagram are rather positive, averaging at around 75 for all brands. PETA has the lowest sentiment at 61, while the “wwf” profile of WWF takes the top with 92. Malalafund takes the second place with a sentiment of 91, while UNICEF and UNESCO share a score of 89 for the third spot in terms of sentiment. Who loves mango? Two-year-old Maria John was brought back from the brink of starvation through a dedicated malnutrition treatment programme at a UNICEF-supported hospital in Juba, South Sudan. Due to ongoing insecurity, an estimated 1.1 million children are severely malnourished in #SouthSudan. Five years into the conflict, UNICEF remains dedicated to providing life-saving assistance to children like Maria John. Check out our story for more. Photos by @albert_gonzalez_farran. #ForEveryChild, health. When it comes to Twitter, a powerful message that moves people seems to be the prevailing factor. In terms of audience size, prominent nonprofits, such as Unicef, American Red Cross, Amnesty International, WWF, the Human Rights Watch and the World Economic Forum all boast audiences of above 3 million followers. Closely following at seventh place is Save the Children US with 2,96 million followers and UNESCO with 2,87 million followers. While all aforementioned NGOs are recognizable all over the world and is thus their position as the top nonprofits is not surprising, the 9th and 10th place are not as familiar to the western audience. In particular, the İstanbul Kültür Sanat Vakfı (İKSV), or the Istanbul Foundation for Culture and Arts, founded in 1973, takes the 9th place on this list with 2,50 million followers. The tenth place might also not be as recognized by everyone, but is a prominent non profit organization aimed at reducing the violence among all cultures and nations, the Non-Violence organization, coming with 2,48 million followers. In terms of total engagement, probably the most surprising are the numbers below 10,000. For million-strong followership, as much as 3 NGOs have less than 10,000 total engagement, 2 other have less than 20,000 and from the remaining five only Non-Violence, the WEF and UNICEF have total engagement above 100,000. The IKSV has a total engagement of a mere 112. It’s not surprising that with the low engagement numbers, the ER will also be low. All of the nonprofits have engagement of 0.00% with the exception of UNESCO and WWF with 0.01% engagement, UNICEF with 0.02% and Non-Violence with 0.07%. Yet, probably due to the positive nature and lack of surrounding controversy, all the organizations with the exception of IKSV with 65 score, have a sentiment above the 70 score mark. What this brings us to is that Twitter is able to drive people towards positive change and gather them in huge numbers, yet the engagement is far from what it should be. 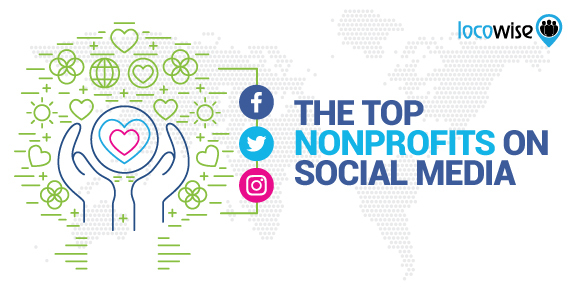 One of the most obvious items to take from the analytics of the top nonprofits on social media is the difference between the top three social networking platforms. While Facebook was covered in controversial issues, the posts filled, informative political matters were boasting the best numbers, Instagram took visual matters to heart. Without actual disregard for the messages of those nonprofits, it’s obvious that part of the reason behind their amazing Instagram success was certainly the photo-opportunistic chances of those organizations. At the same time, Twitter has the strongest and most vocal and emotional of messages, such as Human Rights, Save the Children, UNESCO, the Red Cross, Amnesty International and more. Want to dive deeper into the analytics? Sign up for a 7-day free trial of Locowise to understand the truth behind the numbers! Metrics, data and analytics for you and your competitors!